Highlander Celebrates 75 Years of Social Activism Though its name may not be well known, Tennessee's Highlander Center, which celebrates its 75th anniversary this weekend, was central to the training of many of the country's best-known civil rights heroes between the mid-1950s and early '60s, including Rosa Parks. 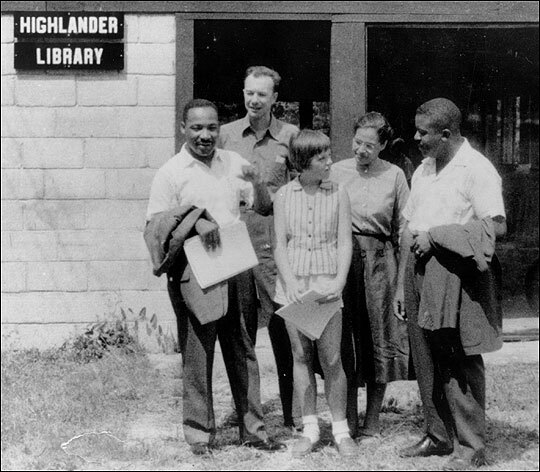 From left, Martin Luther King, Pete Seeger, Charis Horton, Rosa Parks and Ralph Abernathy gather at Highlander's 25th anniversary celebration in Monteagle, Tenn. in 1957. At the time, Highlander was one of the few places where black and white activists could meet. 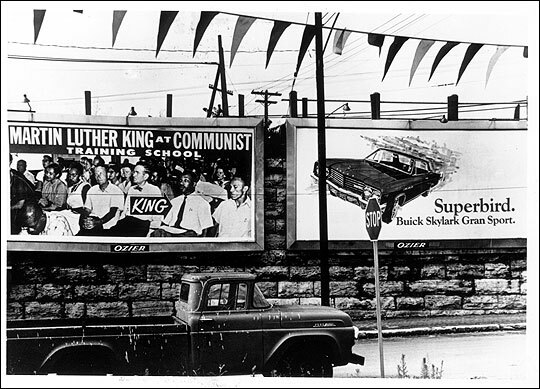 A billboard in Knoxville, Tenn., in the early 1960s shows Martin Luther King Jr. sitting with Myles Horton at a Highlander meeting. 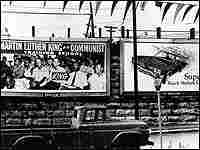 The billboard reads "Martin Luther King at communist training school." From its humble base in tiny New Market, Tenn., the Highlander Center has left an indelible imprint on the nation's social and economic justice movements. Though its name may not be well known, Highlander, which celebrates its 75th anniversary this weekend, was central to the training of many of the country's best-known civil rights heroes between the mid-1950s and early '60s, including Rosa Parks. It began as the Highlander Folk School in 1932, offering adult education courses to the poor. But it had an unusual curriculum. "You'd have class on reading ... but they are not reading 'see Jane see' or 'look spot look,'" says John Glen, a history professor at Indiana's Ball State University. "It's how to read South Carolina's constitution so you can pass the (voter's) literacy test." There were no books or tests. The school hosted one- to two-week residential seminars. During the '30s and '40s, the school hosted labor-organizing seminars. But by 1952, Highlander's board of directors had decided that they wanted to address the issue of segregation. The school was already hosting some integrated classes, so it increased them and added how-to courses on passive resistance and voter-registration drives. "Long before we started sitting in, long before we'd been on the freedom rides, some of us got our foundation ... at Highlander," says Georgia Congressman John Lewis, who visited Highlander as a college student. Lewis went on to organize lunch counter protests and eventually lead SNCC, the Student Nonviolent Coordinating Committee. 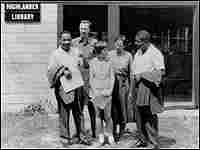 At Highlander, Lewis sat elbow-to-elbow with civil rights leaders such as Dr. Martin Luther King, Julian Bond and Ralph Abernathy. As the black civil rights movement exploded, the school became a lightning rod for segregationists who condemned it as a communist and radical breeding ground. The school's former attorney, George Barrett, says members of the Ku Klux Klan attacked the staff, the state police raided it and nearby governors railed against it. "You had bubbling up in the South all these sorts of sovereignty commissions ... who were going to keep us pure and white and save us from the communists," Barrett says. "Highlander became the focal point for them to zero in on because of the labor connections and the civil rights connections." Barrett represented the school when the state of Tennessee tried to shut it down over accusations of mismanagement. The Highlander Folk School facility was shut down in 1961. The school's founder, Myles Horton, told a television interviewer in 1981 that he laughed the day they padlocked the building. "My friend here, he thinks he's padlocking Highlander," Horton said. "But Highlander is an idea. You can't padlock an idea." The school's staff bounced around two different locations before landing in New Market, Tenn. At the time, staff members used pre-fab vacation-home kits, because local builders refused to work on a new school. Today those buildings still stand. Highlander outlasted both its founder — Horton died in 1990 — and his segregationist foes. Today the school, now called the Highlander Research and Education Center, hosts annual teen activist camps and seminars on bilingual labor organizing and immigration, among other issues. It seems scatter-shot but Highlander's new director, Pam McMichael, says the school is adjusting to the times. "The moments shift, and good organization is knowing when you shift with those moments," McMichael says.